Since the entire length of the Czech Greenways corridor is over 350 miles (500 km), linking Vienna and Prague. Travellers can walk or bike between historic towns and villages, visit romantic castles, medieval churches and monasteries, discover old Jewish sites and savour some of the most picturesque countryside in Europe. 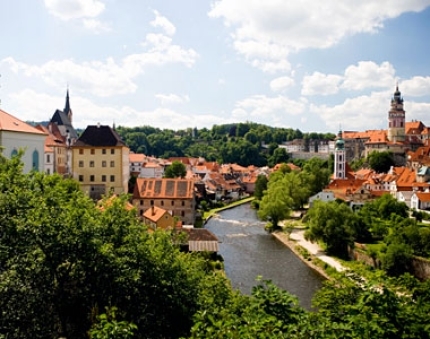 The routes stretch along the Vltava River Valley in Southern Bohemia and the Dyje River Valley in Southern Moravia, the settings of numerous folk and music festivals. This hiking trip covers a selection of only the best foot trails and hiking spots along the Greenway system. These hikes are attractive because there are so many highlights along the route allowing you the ability to explore and discover the local flavour and culture. The walks are on the Czech Republic's excellent and dense network of signed hiking trails, which were created over 100 years ago. This walking tour is suitable for hikers capable of covering greater distances on foot, or for more recreational hikers (up to 6 miles / 10km per day).